TOTAL QUANTITY: 36 BLACK FITTED T-SHIRT WITH "WE GOT THE BEAT" ON A BRIGHT STRIPE BACKGROUND. NEON PINK, GREEN, ORANGE, OR PURPLE TULLE TUTU SKIRTS WITH ELASTIC WAIST. LEGGINGS NOT INCLUDED. THIS COSTUME RUNS SMALL. TUTU SKIRTS ARE ONE SIZE FITS MOST. PLEASE SELECT YOUR COLOR AND THEN SPECIFY WHAT SIZE SHIRT YOU WOULD LIKE...WE WILL MATCH AS CLOSE AS POSSIBLE. TOTAL QUANTITY: 65 AVAILABLE SIZES: 22 SMALL LEGGINGS 26 MEDIUM LEGGINGS 17 LARGE LEGGINGS **ONLY 41 T-SHIRTS IN STOCK. YELLOW, PINK, GREEN,ORANGE AND WHITE LEOPARD AND ZEBRA PRINT LEGGINGS. BLACK TANK TOP WITH "PARTY ROCK CREW" IN PINK, GREEN, BLUE AND YELLOW PRINT. TOTAL QUANTITY: 55 SLEEVELESS AQUA BLUE VELVET DRESS WITH RHINESTONE DETAIL. AQUA SHORTS INCLUDED. 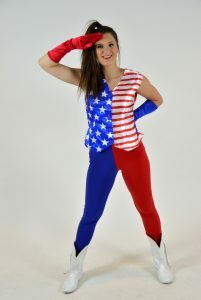 MADE BY LEAPIN LEOTARDS. TOTAL QUANTITY: 64 TOP: 18 SMALL 37 MEDIUM 9 LARGE LEGGINGS: 0 SMALL 50 MEDIUM 49 LARGE GREAT AZTEC MULTI COLORED LEGGING SET BY "SEE YOU MONDAY" FEATURES A AZTEC PRINT LEGGINGS WITH AN ELASTIC WAIST. A BLACK LOOSE FITTING CROP TOP TO MATCH, SPORTS BRA NEEDED FOR COVERAGE. ITEM NUMBER: WHHS95-S TOTAL QUANTITY: 33 THIS BELLHOP JACKET IS RED POLYESTER THAT ZIPS IN THE BACK AND HAS GOLD BUTTON AND BRAID DETAILS WITH A MATCHING PILLBOX HAT. 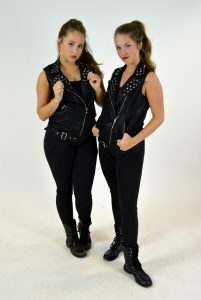 TOTAL QUANTITY: 82 AVAILABLE SIZES: 32 SMALL 48 MEDIUM 2 X-LARGE BLACK PLEATHER BIKER VEST WITH ZIPPER UP THE FRONT AND 2 FRONT POCKETS. HIGH COLLAR WITH SILVER SPIKED STUDS ON THE COLLAR AND FOLD OVER LAPELS. WAIST LENGTH. BELT GOES AROUND BOTTOM OF THE VEST AND CAN BE REMOVED. HAS SILVER BUCKLE AND ZIPPERS. BY FOREVER21.BELT NOT INCLUDED. TOTAL QUANTITY: 107 FUTURISTIC BLACK AND METALLIC SILVER LEOTARD WITH ATTACHED WIRED HOOP SKIRT. THIS LEOTARD IS SLIM HALTER STYLE WITH HIGH NECK, CLASPS IN BACK, MODERN PATTERN ON FRONT WITH ATTACHED WIRE ROUND HOOP WAIST SKIRT. SILVER SPATS AND ARM/WRIST BAND MAY NOT BE INCLUDED. TOTAL QUANTITY: 42 AVAILABLE SIZES: 3 X-SMALL 14 SMALL 16 MEDIUM 6 LARGE 3 X-LARGE THIS COSTUME IS SURE TO BE A STUNNER WITH RHINESTONE AND FRINGE ACCENTS! BY SPARKLE, THIS BIKETARD HAS A CREW NECKLINE AND LACK LYCRA WITH BLUE RHINESTONES TO ABOUT THE BRA LINE. THE NECK TIES WITH TWO STRAPS AND FRINGE ACCENTS HANG TO THE BOTTOM OF THE BIKETARD. FROM THE BRA LINE DOWN THE BIKETARD HAS A BLUE METALLIC FABRIC WITH A 2 1/2" INSEAM. THE MODEL IS WEARING A SIZE MEDIUM. GREAT FOR JAZZ, TAP OR TEAM POM ROUTINES! TOTAL QUANTITY: 35 GREY DRESS WITH BLACK SHIMMER SHORT SLEEVES, SHOULDER PADS AND A DIAGONAL 'V' WITH BLACK STRAP. MADE BY KELLE. 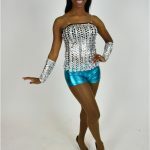 TOTAL QUANTITY: 58 AVAILABLE SIZES: 21 SMALL 26 MEDIUM 4 LARGE 4 X-LARGE THIS SHIMMER SET IS SURE TO SHINE IN ANY PERFORMANCE! THIS TWO PIECE SET FEATURES A SHEER BLACK TO WHITE SHIMMER OMBRE FABRIC THAT SHINES IN THE LIGHT WITH MOVEMENT. THE CROP TOP HAS A 7 1/2" INSEAM FROM THE ARM PIT. THERE IS A 3" BLACK VELVET BAND AT THE BOTTOM WITH A DIAGONAL PIECE OF VELVET BLACK FABRIC ACROSS THE FRONT. THE REST OF THE FRONT IS MADE OUT OF LINED SHIMMER FABRIC. THE BACK OF THE TOP DIPS TO THE BRA LINE FOR COVERAGE AND FEATURES TWO THIN BLACK VELVET NON-ADJUSTABLE STRAPS. (STRAPS MAY BE PINNED). THE SHIMMER FABRIC ON THE FRONT FEATURES ROUCHING WHERE IT MEETS THE VELVET. THE SKIRT FEATURES A HIGH LOW CUT DIAGONALLY WITH ATTACHED BLACK VELVET SHORTS THAT FEATURE A 1" INSEAM. THE SHIMMER FABRIC COVERS THE SHORTS AND IS THE SAME MATCHING OMBRE FABRIC THAT IS ON THE TOP. THE MODEL IS WEARING A SIZE MEDIUM. TOTAL QUANTITY: 46 AVAILABLE SIZES: 9 SMALL 29 MEDIUM 9 LARGE 1 X-LARGE FUN AND UNIQUE UNITARD BY LEAPIN LEOTARDS IS A BLACK PLEATHER UNITARD WITH SHEER MESH SEQUINED V-NECK AT THE FRONT WITH SHORT CAP SLEEVES AND A SNAP BACK TO A SMALL KEYHOLE BACK. THE BACK OF THE UNITARD IS DETAILED WITH PINK AND GREY WATERCOLOR AROUND THE SIDE OF THE CHEST TO THE BACK. THE UNITARD IS PAIRED WITH BLACK GUANTLET GLOVES. THE BIKETARD RUNS SMALL IN THE TORSO. THE MODEL IS WEARING A SIZE SMALL. 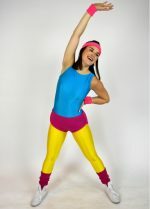 TOTAL QUANTITY: 36 AVAILABLE SIZES: 3 TEEN 14 SMALL 12 MEDIUM 6 LARGE 1 X-LARGE BLACK AND HOT PINK LYCRA BIKETARD. MOCK TURTLENECK AND ZIPPER UP THE BACK WITH ONE FISHNET SLEEVE. BY KELLE. TOTAL QUANTITY: 35 FLIRTY AND FUN BLACK AND PINK BIKETARD. LONG SLEEVE PUFFY WITH TIGHT WRISTS. HOT PINK SPARKLED DETAILING ON LOWER HALF WITH HOT PINK COLLAR, V-NECK ZIPPER DOWN THE FRONT. BY TEAM GO FIGURE. TOTAL QUANTITY: 51 AVAILABLE SIZES: LEOTARD: 13 SMALL 34 MEDIUM 12 LARGE 1 X-LARGE SKIRT: 6 X-SMALL 34 SMALL 9 MEDIUM 2 LARGE TWO PIECE BLACK AND PINK GLITTER LEOTARD AND SKIRT. BLACK LEOTARD WITH ONE LONG SLEEVE AND ONE NO SLEEVE. SKIRT IS BLACK GLITTER WITH PINK LAYERS UNDERNEATH. TWO RUFFLES AT THIGH LENGTH, PUCKER GATHER IN FRONT ON ONE SIDE. MADE BY CLINGONS. TOTAL QUANTITY: 11 THIS DRESS RUNS SMALL BLACK DRESS WITH VELOUR BODICE AND SHEER BLACK SLEEVES WITH A BLACK AND RED LAYERED LACE SKIRT. TOTAL QUANTITY: 36 AVAILABLE SIZES: 13 SMALL 21 MEDIUM 2 LARGE BLACK VELVET BODICE & RED SATIN TRIM; ATTACHED SATIN SKIRT HAS BLACK TULLE PETTICOAT UNDERNEATH. LACE UP BACK WITH SPAGHETTI STRAPS. COULD BE USED AS SHORT CAN CAN DRESS. MADE BY GEORGIE GIRL. LARGE TEAM SET. TOTAL QUANTITY: 21 BY LEAPIN LEOTARDS, THIS CUTE RED AND BLACK METALLIC TOP FEATURES A PINSTRIP PRINT ON THE SIDES WITH SILVER METALLIC PINSTRIPES. THE FRONT HAS RED METALLIC ACCENTS AND A CORSET STYLE DESIGN. THE NECKLINE IS A SCOOP NECK AND THE TOP HAS TWO THICK BLACK STRAPS. THE RED CONTINUES HORIZONTALLY ACROSS THE BACK OF THE TOP. THE TOP HAS A 13" SEAM FROM THE ARM PIT AND IT GOES TO TWO POINTS AT THE BOTTOM HEM. THE MODEL IS WEARING A SIZE MEDIUM. ITEM NUMBER: BHS286-S TOTAL QUANTITY: 27 BRONZE SEQUIN BIKETARD WITH SPAGHETTI STRAPS AND BLACK AND BRONZE TULLE OVERLAY SKIRT AND BLACK TULLE 1 SHOULDER OVERLAY ON TOP. BY CURTAIN CALL. TOTAL QUANTITY: 51 AVAILABLE SIZES: 14 SMALL 25 MEDIUM 12 LARGE LONG SLEEVE BLACK AND SILVER SEQUINED, ZEBRA PRINT HOODED JACKET. BY LEAPIN LEOTARDS. TOTAL QUANTITY: 44 SIZES AVAILABLE: 4 X-SMALL 11 SMALL 20 MEDIUM 7 LARGE 2 X-LARGE BLACK NYLON SKIRT WITH SILVER METALLIC LINING IS MADE BY DANZGEAR. THE SKIRT TIES AT YOUR WAIST. TOTAL QUANTITY: 35 AVAILABLE SIZES: 7 SMALL 20 MEDIUM 8 LARGE BLACK WITH SILVER PINSTRIPED TUXEDO STYLE HALTER. THICK VELVET COLLAR THAT SNAPS AT THE BACK OF THE NECK. RED METALLIC PANEL DETAILING WITH AND OPEN CRISS CROSS BACK. BY LEAPIN LEOTARDS. TOTAL QUANTITY: 63 AVAILABLE SIZES: 33 SMALL 27 MEDIUM 3 LARGE GORGEOUS FULLY SILVER SEQUIN SLEEVE AND BLACK SEQUIN TANK AND PANT SET. BY BALERA DANCEWEAR, THIS SET IS A COTURE, MODERN FUTURISTIC SET SURE TO SPARKLE. **THIS SET IS CHOSEN BY THE SLEEVE SIZE, THE OTHER PIECES WILL MATCH AS CLOSELY AS POSSIBLE. ** THE MODEL IS WEARING A SIZE SMALL. TOTAL QUANTITY: 55 BLACK AND SILVER STRIPED SLEEVELESS HALTER TOP WITH RED SHIMMER ATTACHED TIE AND COLLAR. HAT NOT INCLUDED. TOTAL QUANTITY: 65 BLACK AND WHITE CHEVRON BIKETARD WITH THICK BLACK CROSSING STRAPS AND SLIGHT RUCHING IN THE MIDDLE BUST. COMES WITH BLACK SATIN RUFFLE SKIRT. MADE BY SPARKLE. GLOVES NOT INCLUDED. THIS SET IS CHOSEN BY BIKETARD SIZES, THE SKIRT WILL MATCH AS CLOSELY AS POSSIBLE.